A few weekends ago, we braved a 3-hour road trip with a fussy toddler and 2 kids for some “relaxing” beach vacation time. The traveling part aside, the whole trip went rather smoothly, and that’s because of good planning and packing (on my part, THANK YOU!). Packing for a 4-day beach trip doesn’t have to be complicated, you just have to make sure to pack everything you need without leaving anything behind… Easy, right? In all seriousness, forgetting to pack things can result in spending more money and sometimes, not being able to enjoy your vacation. And don’t get me started on all the stuff you need to lug through the sand and back… Some of it you DON’T need… or there’s an EASIER way! Through trial and error, I’ve found the perfect collection of items that work perfectly for our family beach trips. They don’t only make our beach trip enjoyable, but fun! This post contains affiliate links which means when you make purchases through these links, you are supporting Wine and Lavender- at no cost to you- and I appreciate that so much! My opinions are my own. We had the laundry going all day long- washing everything we needed for the trip (plus, I didn’t really want to leave dirty clothes sitting around in the house for a few days and wanted to get as much clean as possible before we left). The clean laundry was folded and placed on my bed, the suitcases lined up on the floor, and I went person by person (or suitcase by suitcase) packing what we would need for each day starting with the first day we got there (pjs, underwear, etc…). When you do this train-style, it’s helpful because it ensures that each person gets what they need. Everything that was going into the trunk the day of our trip was neatly situated in the garage, ready to be thrown in the car the next morning. Items like the canopy, wagon, picnic blanket, beach toys, pool bag, and the stroller were stacked and ready. All we would need from inside were the suitcases and snack bag. I packed a separate bag with towels, swimsuits, sunscreen, and pool toys. This way, if our room wasn’t ready when we arrived (we were set to arrive 3 hours before check-in), we could easily change and get our energy-full kids out of the car and into the pool right away. With everything in one bag, there was no searching or ransacking through suitcases necessary. Instead of packing individual sandwiches, I bought a giant French loaf (cheaper than a loaf of sliced bread- and tastes better, too!) and made one giant sandwich that I cut into smaller portions and threw in a large ziplock bag. (I had packets of mayo on the side.) Between that sandwich and all the snacks I threw in our thermal, we had more than enough to get us through the 3-hour trip, and for a while thereafter. In all honesty, we didn’t really need the snacks because it was a shorter drive and we didn’t want to encourage the kids to drink anything for fear of having to make stops. BUT since our hotel didn’t allow check-in until later in the afternoon, it worked out perfectly to have food (lunch) ready to eat as soon as we got there- which just so happened to be lunch time. It helps to pack in bags, or dedicate each bag to a certain event during the trip. 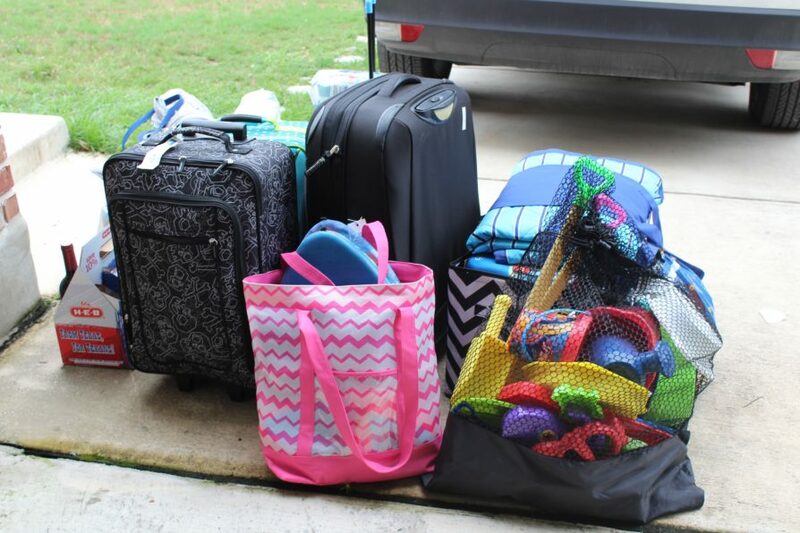 Each person has their own clothes bag (suitcase), then come the shared toiletries bags (Kids & Parents), and then you have the pool bag, the snack bag, and finally, the beach wagon to hold them all. Curious about what goes into each bag? Well, I broke it down for you… (and don’t worry, I know this is a lot to take in, so I created a FREE PRINTABLE for you. Check it out below. Only pack what you need and pack clothes that are versatile… that can be worn in different ways to save some space! Anything you will need for the pool area! Wagon- Because I’m not carrying a bunch of stuff. The wagon held everything and was perfect for transporting it all. 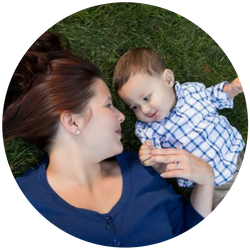 I had gotten the wagon with a removable canopy which was great because it shielded our items (and kids) from the sun when needed and last year, my son was able to take a nap in it. Canopy- Because of the sun. We had 4 adults and 3 kids- the 10×10 slanted leg tent with removable canopy worked perfectly. We were able to set it up quickly, and during the hottest point of the day, we just removed the canopy- packed everything else up, but left the frame on the beach (it was a private beach and this was allowed) for later use. Oversized Beach Blanket- Because I wasn’t going to wash a million towels. While the kids (and adults) spent very little time on the blanket, it was nice to have something to sit on while relaxing under the canopy (and it’s even nicer that the sand doesn’t stick to this particular blanket!). It was an oversized picnic blanket that folded up into a neat carrying case. Worked perfectly. Ziplock Bag- For waterproofing or sand-proofing things that need to be “something-proofed”. Your kids will also want to collect shells. Ziplock bags work great for this. (TIP: Make sure they’re only collecting old shells and not living things that will die in your garage and leave behind a horrendous odor). Mesh Bag- Because you want to keep all the wet stuff together, but able to dry and most importantly, you want the toys in, but the sand out. Goggles- Because beach water stings the eyes. They are relatively small and easily portable. Towels- Although I packed 7 (1 for each family member and 2 extras), I only brought 4 to the beach because we could share, they dry quickly and I wanted to reserve some clean ones for the rest of the trip. Sunscreen- Don’t forget to bring it with you! It should be applied 30 minutes before heading to the beach, and should be reapplied frequently especially during water play. I prefer a sunscreen lotion for the face so as to not get in anyone’s eyes. I also prefer to spray it on outside or on a balcony so as to not get the room smelling like it. An Extra Bucket- Keep one bucket at the canopy for washing hands of sand. We had a collapsible one that was easy to store. I definitely recommend it! A Washcloth- For washing eyes if sunscreen/salt water gets into them. I bring a washcloth and pour water from the water bottle on it to clean eyes. Sunglasses- BUT don’t forget to take them off before you get in the water!! I lost a pair that way this trip. Snack Bag- The kids almost always want a snack, so I bring a large ziplock of heat-proof snacks while we’re on the beach. If you’re going to spend the day and need to bring lunch, a collapsible cooler instead of a hard one is better for lugging around. Waterproof Bag- If you’re not comfortable with just using the Ziploc, get one of these for your phone, room key, and keys- it’s easier to have a small waterproof bag to carry around instead of a purse. From what we brought from home and this list, we were able to feed a family of 5 for 4 days (with the exception of going out to eat once). We had frozen breakfast sandwiches or breakfast tacos for breakfast, salads, burgers, hotdogs, or sandwiches for lunch, and spaghetti and meatballs, or brisket for dinner. Our hotel had an outdoor grill area, so it was easy to cook outside. We bought the spaghetti and meatballs just in case of bad weather, and it worked out perfectly. Although all the planning went well, the food menu was done on the fly and the goal for the next trip is to plan for healthier meals. 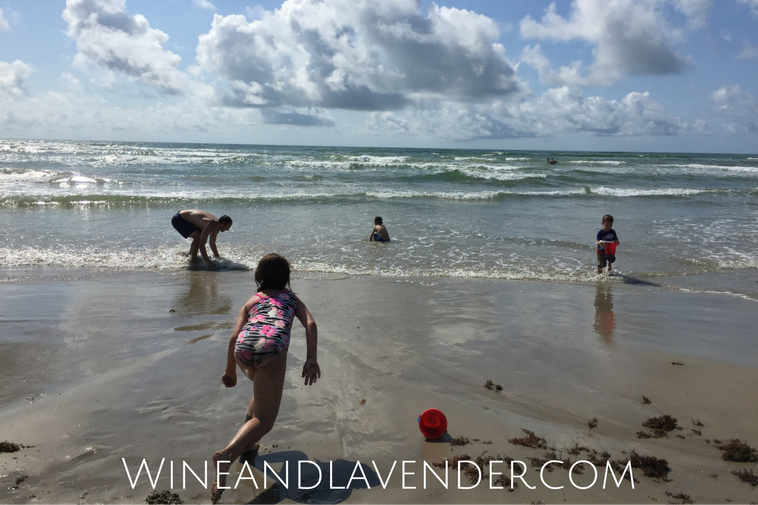 I hope this post has helped you prepare for your beach trip. We always have fun going to the beach and as the kids get older, there’s less to carry and more fun to be had! For more tips and tricks, check out How to Plan a Cheap Family Vacation and How to Swim Safely with Multiple Kids (When You’re Alone). What do you bring to the beach that makes your trip easier? You have a pretty thorough list here. I am so guilty of overpacking – I need to be better about that. Hey Robin! Thanks for stopping by. I used to overpack, too- but we’ve done this so many times, we’ve got it down pat, now. The best part is as the kids get older, the less we’ll have to bring! Hi Cassie!! We’ve already hit the 100’s here in Texas, and although I’m glad summer’s here, I’m already getting overwhelmed with the heat! I haven’t been to the beach recently, but if I go this summer, I will need to pack a lot! Thanks for the reminder. Thanks Theresa! You’re so welcome. 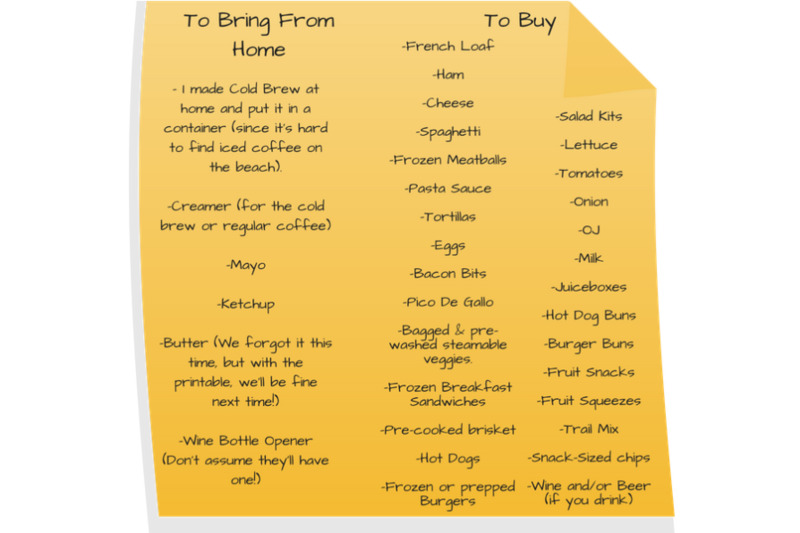 We plan on taking a beach trip this summer, and your checklist is great!I always tend to over pack so I probably need to just take the essentials. Very thorough list! It’s good to keep a toiletries bag separated from what you usually use at home. That’s what I do as well. I have toiletries that’s for traveling only. This is a great guide for families or anyone who’s going on a trip to the beach. Thanks Karen! It’s great to have a separate toiletries bag, packed and ready to go just in case of emergencies! Thank you for all the helpful tips. I always feel like it is a nightmare before leaving on vacation! Preach on Mama! The packing before the trip is the worst part! I feel like we’re bringing the whole house with us and I KNOW we’re going to forget something vital no matter how much I plan. This packing list is just what I need! Hey Marcie! I agree- Packing before the trip is the absolute WORST!! We forgot the butter this time around… It’s kind of hard to make eggs without butter!! I love your packing list! It has been ages since I’ve been to a beach, but I could certainly use a beach vacay right now. UGH! Tell me about it. I think packing will always be my most dreaded part. Lol. I always make sure to pack ahead because of this, especially when we’re not just going to a beach nearby but a beach in a different country. 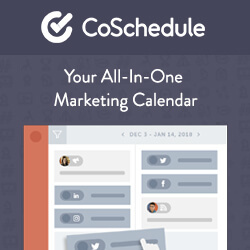 This is an awesome guide! Love the tips! Hi Amanda! Thanks to much! Great list!! It is a lot of work to pack the family up but it is always well worth it!! This printable is so helpful. I usually make a long to-do list before I travel so I don’t forget anything. Making a trip to the beach definitely requires a lot more items to pack so it’s helpful to have a plan in place. Wow this is very thorough! I hate packing, i always end up packing either too much, too little or i forgot major things to take. These are great tips! This couldn’t have come at a better time! I am about to leave on a vacation tomorrow morning for a whole week! Hey Brittany!! I hope this helps, and have fun! Look at you!! You’ve got it all covered, mama. 🙂 This is such a great list. I’m totally a list maker too. Hey Dean! Thanks so much!! Yes- lists make it so much easier!! You have your packing list down to a science! I always get so frazzled trying to pack everything for a vacation. I think I’ll be using your list! Yay Cassie! I hope it helps!! 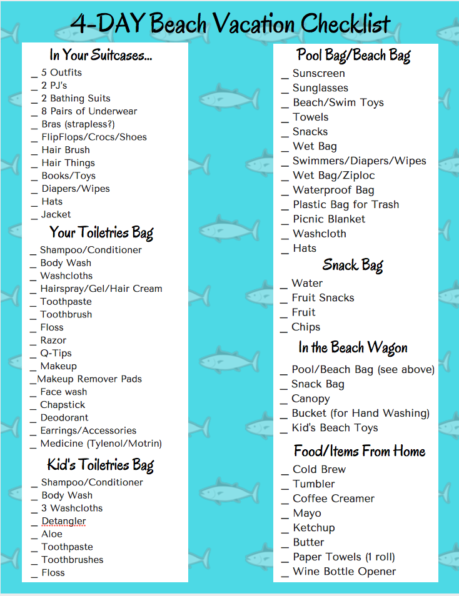 This is a great beach vacation packing list. In my list, I will pack an oversized beach umbrella or beach canopy because I get dizzy if I’m exposed to too much sun. Hi Ana! I hope this helps! have fun on your trip! Wow, you’re very organized. Lol, I usually just throw some things in a bag and go. And while I don’t have kids, I do bring my dog on a lot of trips. And I do think I spend a little more time making sure she has everything she needs than I do on myself. So I can see how thorough you would want to be when you have kids. Hey Erica! Thanks! Whenever it’s not just you, it becomes a project! I like the idea of having things in the garage the night before. We always forget something no matter how much planning ahead we do! Hey Heather! Even with the list, we always manage to forget something, but it gets better ever year! That is a pretty thorough packing list! I love the printable! I had this awesome list that I made when I went on a cruise. I wish I still had it. For once in my life, I actually managed to think of everything I could possibly need. Looks like you covered pretty much every inevitability with yours! Hey Nikki! Thanks so much! With a few trips and “disasters” under my belt, I managed to come up with the essentials! These long list of tips are absolutely amazing. Thanks for sharing this informative and helpful packing tips. Perfect for summer. I ALWAYS forget something!!! I need to bookmark this to help me when we go on our next trip! This is a great list! I love that you picked beaches. I’m always wondering what the best beach will be for my kids. Thank You, Courtney- I feel like that sometimes, too! Thanks! I’ve been packing children to go to the beach for over 20 years – but every year I doubt myself. I really enjoyed reading your tips because you do your packing EXACTLY like I do! It made me feel so much better to read everything and remind myself “I got this”! Thanks for taking the time to write it all down. Aww thanks, Tammy! Great minds think alike! !